← Weekly Update: Update o’rama! Mike’s hands clung to the ceiling as he maneuvered his way to the rear of the ship and back to his engineering room. It had taken a great deal of time, but he had managed to build a web that spanned across all portions of the ship’s ceiling that didn’t open and for the cargo bay he’d managed to skirt the far walls so even when the doors were opened the webs wouldn’t tear. He was much faster at traveling upside down and it took under a minute to reach the engineering room. The room was nothing more than a ten by ten square, but off to either side of the room tubes disappeared into each of the engines; tubes only Mike could fit down. It was Vic’s assumption that it was fate that put Mike on this ship. Mike had been told that Vic was the superstitions type and to play on that as well as become the man’s friend. Mike succeeded. Mike reached down from the ceiling and pressed a button on a bank of controls. Why they hadn’t redesigned the ship so the button to charge the engines was in the cockpit was beyond Mike, but he’d never questioned Vic about this. Vic wasn’t very smart. Of course he was the best. Mike’s placement on the ship had been planned. The boss had made sure Mike was here. Mike was to also make sure that Vic didn’t get into any trouble until everything was set up. Big plans were in store for Vic. Plans the man knew nothing about. When Mike had supposedly stumbled upon Vic, it was very convenient that their engineer had been thrown in jail. The boss had planned that as well as how Mike was to meet Vic; in a fight. Vic was a sucker to save someone in a fight. It was tough for Mike to throw the fight, but Vic lived up to his reputation and fought on Mike’s behalf. And the deal was sealed. Vic needed an engineer and Mike was there to fill the billet. At the time Vic had only Argmon, June, and Dexter. It wasn’t until much later they’d found Joop-Nop trying to chew on an intolerable barkeep’s leg and Vic was there to save the retched creature. Worthless piece of slime Joop-Nop was and Mike had tried more than once to be rid of it. Then there was that pitiful hunk of scrap SPX-39. Mike shook his head. Now there was the boy to be concerned about. That wasn’t something Mike had planned for nor had the boss. He was going to want to know about this development right away. There was precious little time. Barely four minutes and even then it would be cutting it close. Mike scampered up into the webbing at the top of the room. The rest of the crew, the boy, Joey, included, all hated spiders and wouldn’t dream of entering Mike’s web. That played to his favor. He had built a funnel in the furthest corner of the room with communication equipment hidden away there. Equipment that would allow him to contact the boss and no one else on the ship would be any the wiser. Inside the funnel Mike donned his headset and flipped a switch on a small black box. There was a long wait of static. Mike didn’t want to wait. He needed to speak to the boss right away. He closed his eyes and counted to ten. If there was no response in that time, he would have to try again later. He was on seven when his response came. “Report.” The voice was harsh and gravelly. Mike paused. This was the first time in over a year that the boss had raised his voice. Mike could hear the tension in the voice. This had to be important. This was what he had been put here for. Almost a year of waiting and working with the crew of the SS Acid Rat and it was all going to pay off soon. He had to contain his excitement. A beep sounded from below in the room. Mike landed in a chair and buckled himself in just as the engines sounded up and the ship entered hyperspace. He didn’t notice Joop-Nop oozing across the floor and out of the engineering room. The ship came out of hyperspace on the outskirts of the Planchar system. Vic knew that Joey would appreciate entering a star system. Planchar wasn’t anything amazing, but it would be fun to see his reaction. Vic had brought the ship close to the system’s largest planet, a gas planet. He didn’t know the name, but it was about twice the size of Jupiter. When they had taken the job he did a fly-by and he was impressed with the sight of it. Purples and oranges swirled together in thick bands across the rainbow of thinner bands. Just like Jupiter, this one had a significant number of moons and Vic had Argmon plot a course that would take them past a couple. “Is that…” Joey didn’t finish his question. Vic was right. Joey continued to stare out the window. Vic put his hand on Argmon’s arm to get him to slow the ship a little. Argmon curled his lip disapprovingly, but Vic knew they would still make it in plenty of time. He wanted the kid to get a good look. This was, after all, Joey’s first time. For being provided with such an amazing sight the kid sure was being ungrateful. Vic was annoyed. Here he wanted to show him something and all Joey could think about was work. And June accused Vic of being dedicated to his job. “Right Vic,” June’s voice said over the con. Joey had sulked back into the passage way. Vic smiled. He’d just gotten rid of Joey’s skulking attitude and instilled him with a sense of responsibility. As the smile faded from his lips, he could only wish he’d ever had a talk like this with his father. Even though the year span on Earth would have been thirty-five or forty years between him and Joey — he could be the kid’s grandfather for crying out loud — it was only seven or eight in this strange future they were in. Vic wanted to make sure Joey didn’t have the feeling of impending doom. When Vic sat down, Argmon was laughing his throaty laugh that told Vic the four-armed, dog-faced mutt thought that whole exchange was humorous. “What’s so funny?” Vic narrowed his eyes furled his brow. The planet and moons left the view port and drifted away behind the ship. They had picked up speed. No sense in wasting time if there was no one around to care what they saw. Vic could enjoy the view at high speed. He’d done this a hundred times before and this time would be no different. “Yes Vic,” the computer said in its sweet tone. Argmon sighed and shook his head as Vic put his feet up on the console and leaned back in his chair. 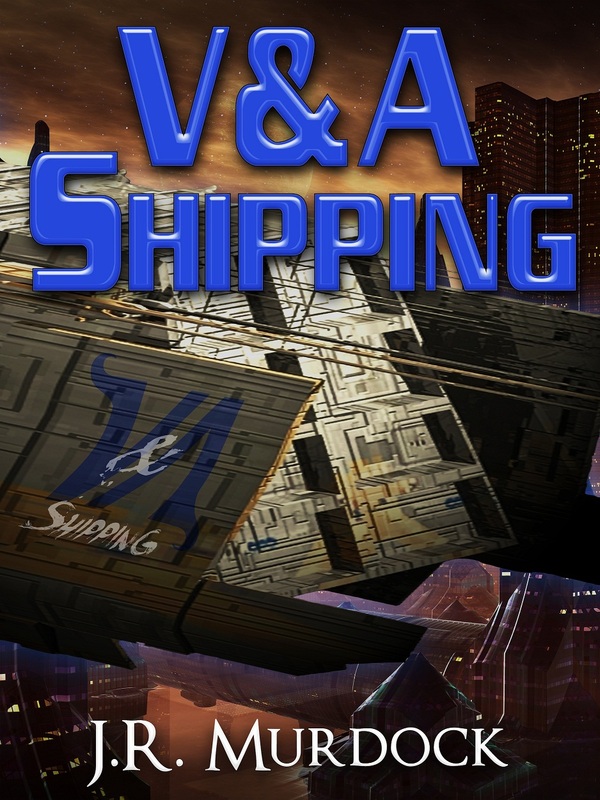 Posted on February 12, 2013, in V&A Shipping and tagged chapter, read along, v&A shipping. Bookmark the permalink. Leave a comment.